As I had mentioned on my previous post, since my meal at Nozomi last year, I've been trying to find a opportunity to make a return visit. With Hong's (of The Ravenous Couple) birthday coming up, I figured this was a good place to have a birthday dinner. After speaking with Mark, the Manager of Nozomi, whom I met last year, we set up another omakase dinner. After having such a good experience with Yasu-San, I requested to have him once again prepare our omakase dinner. On a more recent visit to Nozomi (Yes, I went back again), I found out Yasu-San was from Tokyo, but has been living here in the United States for the past 21 years. Just a little FYI to the readers out there. 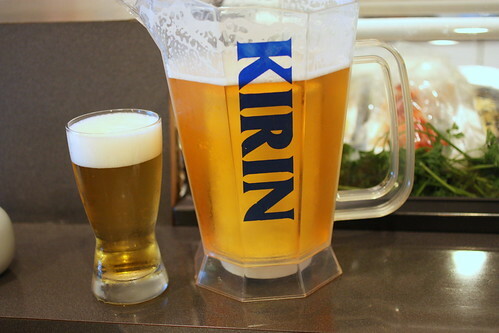 Cold beer is a must order. Always. 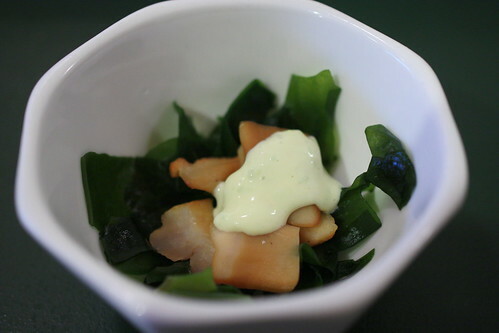 We were first served a small bowl of smoked clams topped with Japanese mayo and seaweed. I enjoyed the smoky flavors of the clams and while I'm not a huge fan of mayo, I did enjoy the addition of the cream flavors of the mayo. 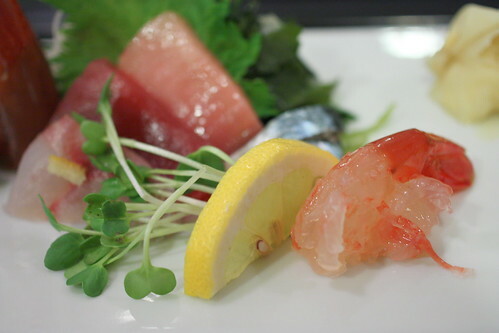 The combination of toro, amaebi (sweet shrimp), aji, and other fresh fishes can't really go wrong as the first three fishes I listed are amongst my favorites. The pieces were cut well, the fish were fish. This was quite a nice start to the meal for me. Yasu-San collected those shrimp heads for later use. 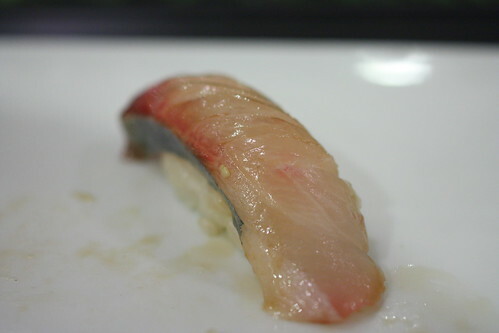 While we waited for the sushi course to start, Yasu gave us each a kohada bone. Think of shrimp chips, but a lot better. I could have easily ate a bag of this while downing some beer. This was actually one of my favorite piece of the evening. I loved the combination of yuzu and lemon. The citrus flavors meshed well with the rock bream, which was a fairly light fish. 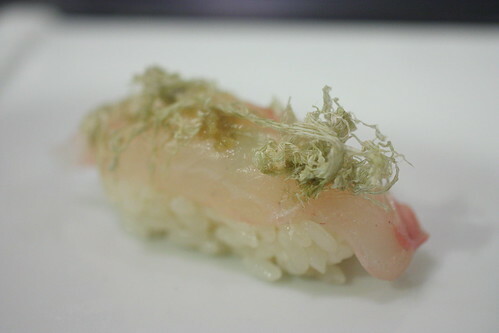 Next we were served the Ishidai, which Yasu said it was a "Rock Posey." The yuzu on top may have looked quite abundant, but it actually worked. 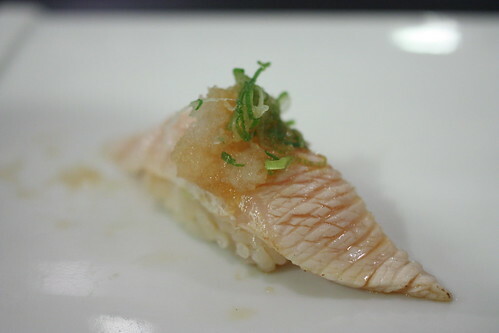 The flavors of the fish and yuzu went well together. Next we were served one of my favorite things to eat: Chawanmushi (steamed eggs). 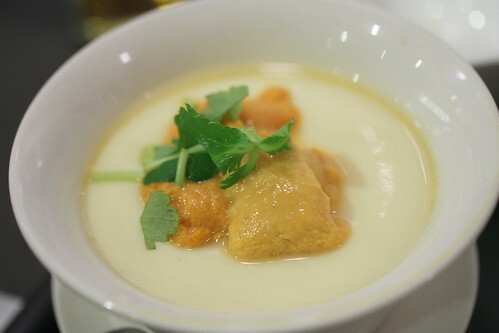 The chawanmushi was topped was fresh uni, the chawanmushi itself contained more uni, sea cucumber, shrimp and ginko nut. I've had many chawanmushi in the past few years, I can safely say this was probably the best chawanmushi I've had. 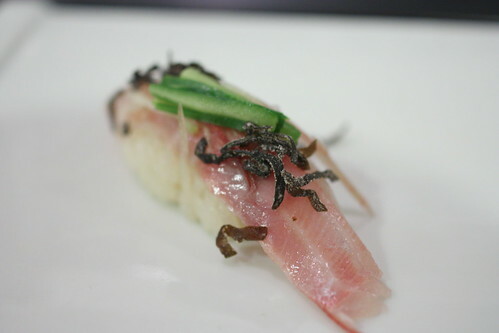 I really enjoyed the use of kombu (seaweed) and a Japanese ginger root on top of the striped pigfish. The flavors were a bit strange at first, but a few seconds later, it just made sense. I really liked the use of kombu here. I usually enjoy red snapper sushi and this was no exception. Though I do have to say the sesame paste was slightly overpowering, it almost overpowered the snapper. This was something I've never had before. 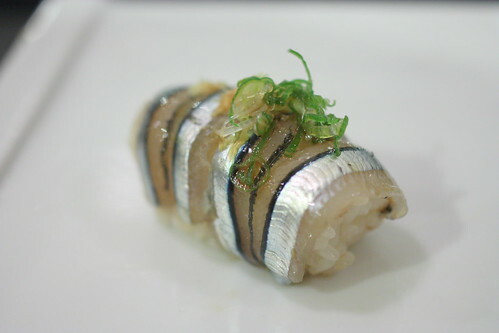 The fish itself reminds me of sayori (needlefish), but it was quite light. Topped with some green onions, it was quite delicious. 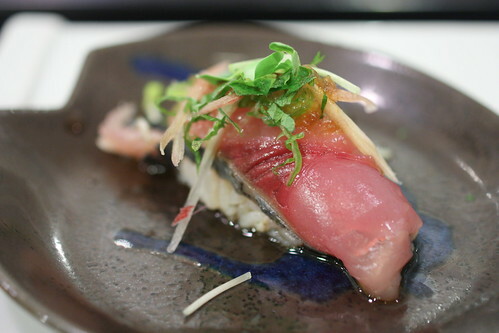 Bonito is something I'm used to in a dried flake form, but not in a sushi form. I absolutely love Aji and this was no exception. Delicious, and as usual, the accompanied green onions and ginger worked great with aji. Mark told us his sea urchin operation has recently expanded by adding sea cucumbers as one of products that it imports. 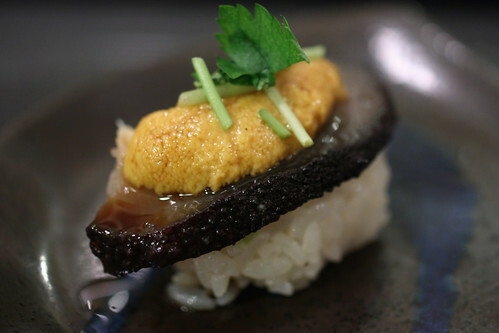 This above combination of sea cucumber and uni was served for the first time ever to us. The uni itself was creamy and delicious, but the sea cucumber was something new for me. 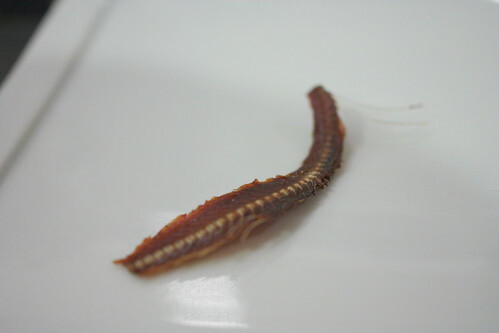 Now, I've had sea cucumber many times in a braised form during Chinese banquets, but having it raw was something else. I loved the texture of the sea cucumber, but the flavors were fairly subtle. 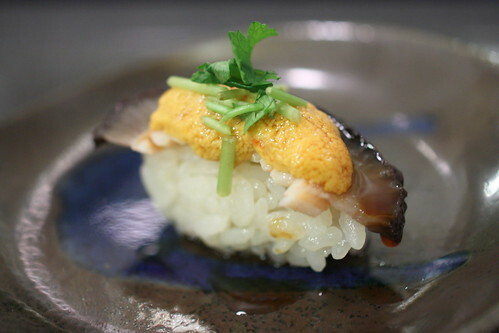 The flavors of the uni and the texture of the sea cucumber made this sushi work. I enjoyed it. 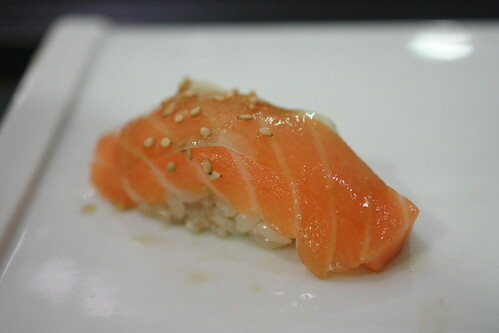 This salmon and white kelp sushi was something I've had on each of my three visits to Nozomi. It's simple, fresh. No complaints from me. 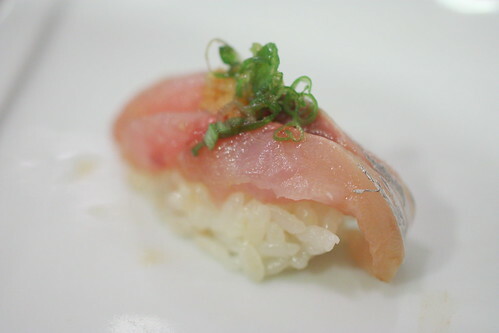 Yellowtail is one of my favorite things to eat at a sushi restaurant, now a seared yellowtail belly? Yes, please! I loved the fatty flavors of the yellowtail stomach, and the seared flavors made it even better. This was very nice. This striped jack was nice. Buttery and quite flavorful. What's not to like? This piece of toro was really, really good. I mean, it's definitely better than what I had last time at Nozomi. It just literally melted in my mouth. It was probably one of the fattiest piece of toro I've ever had. I think I had dreams about this toro after my meal. After all the unique selection of fishes served during this meal, tuna almost seemed pedestrian. 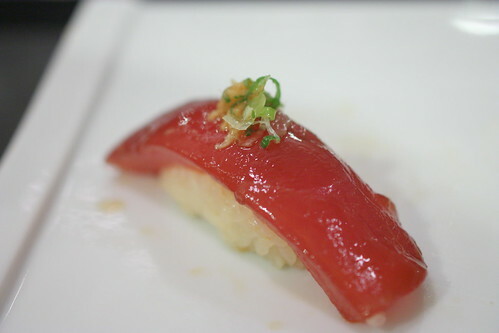 The tuna was delicious, but sadly, it was a bit forgettable after all the other amazing pieces of sushi served. The uni is the star ingredient at Nozomi. As I mentioned in my last post, Mark, is the son in law of one of the biggest sea urchin distributors in the United States, thus, Nozomi probably has the best uni in town. 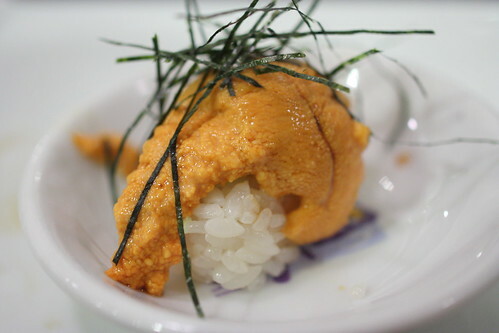 So uni lovers, if you want to eat good uni, just come to Nozomi. Again, the flavors of the uni was rich, creamy, and was simply fantastic. I could have ate a few more pieces of this stuff. 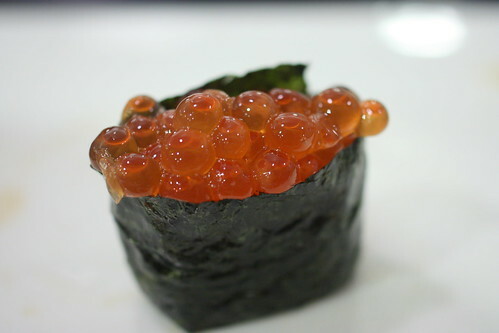 Ikura (salmon roe) is another one of my personal favorites. I absolutely just love the salty flavors of the roe. Our last piece of sushi, and by this time, we were absolutely stuffed. 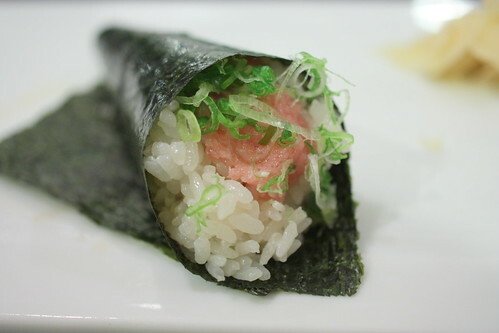 With that said, I'll never turn down toro, especially in a handroll form. 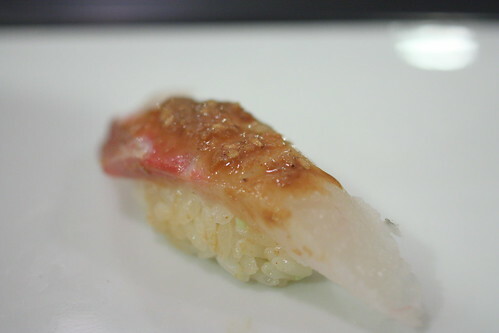 Again, I absolutely love the toro used at Nozomi. So buttery, so rich, so delicious. 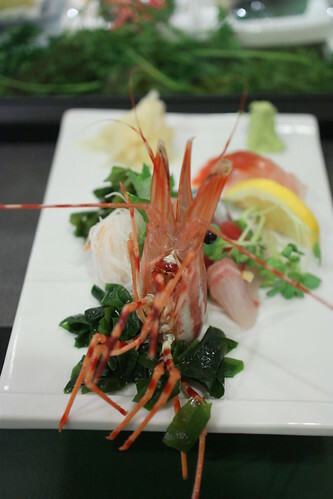 Remember that shrimp head from the sashimi course? Well, it returns inside my bowl of miso soup. 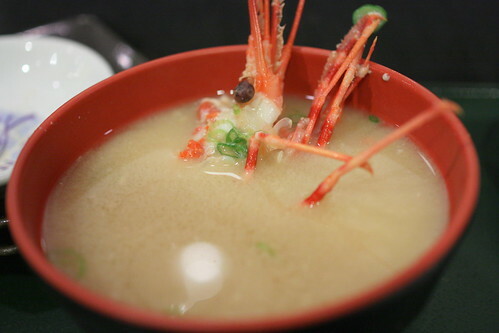 The broth was so nice, and I loved eating the shrimp head as the roe and meat were quite abundant. What a great way to end this meal! 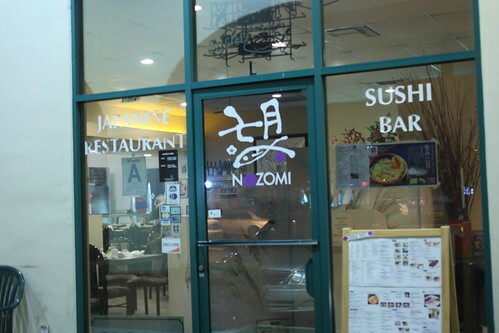 With all of the sushi restaurants around Los Angeles, Nozomi sometimes will get lost in the shuffle. Hidden inside the Musha plaza in Torrance, I can personally say Nozomi has become one of my top 3 sushi destinations in the city. In fact, the only sushi meal I've liked better was at Urasawa, though it's also 5 times the cost compared to a meal at Nozomi. Yasu and Mark again took great care of us during the meal. While the meal itself was slightly different than my first meal there, it was great in its own way. 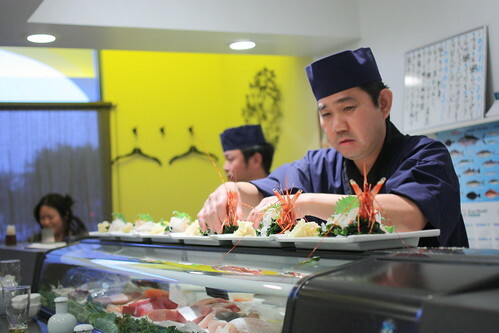 So the next time you're stuck in Torrance looking for good sushi, give Sushi Nozomi a try. Be sure to ask for Yasu! "I've had many chawanmushi in the past few years, I can safely say this was probably the best chawanmushi I've had." strong words buddy-- nozomi's was better than urasawa's? You had me sold on your first post, but now I really really really want to go. Esp the uni part, and that this was your best sushi meal other than Urasawa. The amaebi and uni look fantastic. want want want! Omakaselicious! I think you've just eaten more sashimi in this meal than I've had for the entire year. i'm sooo coming here for good sushi! the rock bream looks amazing. What a beautiful birthday feast! 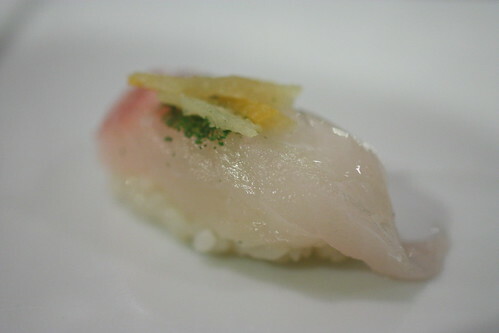 The snapper with yuzu (ishidai?) looks gorgous! I'm not usually the biggest sushi eater (shocking, no? 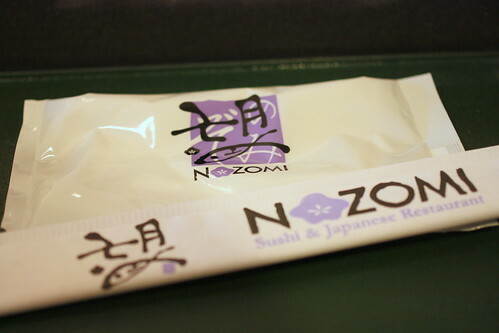 ), but think I'd make an exception for Sushi Nozomi. Yum! This place looks awesome!! I never try omakase here in LA and thinking this one will be a good being my journey! Do you mind telling me how much is this BD meal per person? I notice that there are quite a bit of Uni dishes, did you specify what do you want or they choose thatever is the freshest for you? So sorry for the long questions.. but thanks for your help!! I think the gourmetpigs needs to try some Pigfish, don't you think? Jenn: If you go, I'll join you guys! 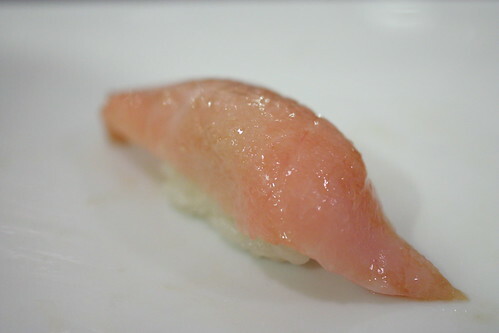 Kristen: It's my favorite sushi (within budget) right now. Cathy: Ya, that's sad Cathy! Anna: I try my best Anna! Diana: Ya, this place was quite delicious! Lyn: I hope you and your family had a great meal. Do the omakase next time! 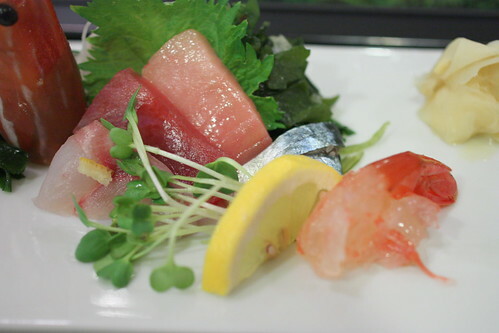 I think you've just eaten more sashimi in this meal than I've had for the entire year.